Parkhead, a village in the Barony parish of Glasgow, situated about 2 miles to the east of the city. It is principally inhabited by the humbler orders of society, consisting of handloom weavers, carters, and labourers.—The population, in 1841, amounted to 1,150. Houses 260. The Glasgow water-works, erected in 1806, and situated upon the Clyde, are in the immediate vicinity of the village. A visitor to Lanarkshire cannot fail to be impressed that the many towns round the coal and iron field seem to be merging into one vast city, at which state, sooner or later, they are fated to arrive. Too often it is forgotten that this is exactly how Glasgow happens to be the Glasgow that we know. Streets like Great Eastern Road serve as a reminder of historic growth. It might be termed the missing link (as a humorous Sandyhills golfer remarked of his club when three consecutive players duffed their tee-shots). It joins Camlachie to the old world village of Parkhead, bearing the disjointed: just growed: appearance that shows traces of Glasgow’s evolutionary movement eastwards and if the Boundaries Bill can make any impression on Sassenach statesmen who know naught of the problems involved. That movement is not yet finished. In its Alpha stages Great Eastern Roads existence is of the Dr.Jekyll and Mr. Hyde variety due to the foresight that made it an imposing main thorough fare and raised the level above the old, or Laigh road. The old road however, as if to make up for the loss of Vinegar Hill and immortality, houses the soul satisfying liquid that the D.C.L. combine in their charity dispense for species. Bulloch, Lade and Company had these premises for many years before. When liberals used to tell fairy stories of Free Competition; to the electorate. Days and beliefs have changed hereabouts. Camlachie Institute, which , belieing its almost 40 years in its handsome appearance, ministers to the local political and social needs, is next in the eastward scheme of the Great Eastern road. And just over the street is the well-known oil firm of Marks and Johnston, whose chief, Mr Marks passed away quite recently. Camlachie Public School smartened up by having stone defects rectified recently, is under the genial Mr Goldie; the dominies here caused jealous flutters in religious dovecots by creating a record in Jumble Sale proceeds some time ago; the janitor, Mr Woods, is secretary of the Glasgow and West of Scotland Ex Naval Association, and a prime mover in their Widows and Children’s Christmas Treat, now an established event. A real hard worker, Mr Woods. A little further east to the right stands the Old Toll House finely preserved and still habitable. There used to be iron posts on the pavement here to mark the limits; the horse-cars made this their terminus, in Dalrymple days when a journey to Coatbridge was regarded as we do a trip to London. Jeanfield Cemetery, (not Janefield as is supposed and as the street in Parkhead is named) was established in 1845 and opened in August 1847. Here the rude forefathers of the hamlet sleep (this is the aptest quotation in my volume, although not too apposite) Mr James Moore, the popular Calton registrar at 90 Great Hamilton Street, has been Secretary and treasurer for many years. To the left is Parkhead Parish Church founded in 1838 as Camlachie Church a mission station under the Rev. Mr.Easson who died in 1842; The Rev.James Findlay the successor ;came out; in the stirring Disruption days of 1843; the church suffered in the turmoil and closed till 1852., when still as a preaching station, it was reopened under the Rev. Alex Rattray,M A.in 1864 it was endowed as Parkhead Quoad Sacra parish Church. Mr Rattray passed away in 1904 and was succeeded in June 1905 by the Rev,D,Hunter Brodie,M.A ;B.D, the present popular minister. Passing Van Street where Mr J,H,Kelly, a well known unionist politician, makes the articles in question, one sees to the right the counterblast to the D.C.L..Barrs Lemonade Works. This is built on the site of the Belvedere Bowling Clubs first green of which more anon. At the corner of Parkhead Cross the imposing building takes the place of a two storey one, where Gibbie Watson had a bakery .and the old post-office was. Davie Willox to whom no one who writes of Parkhead can fail to be indebted, tells of a pawn shop ,too, at the corner of Burgher Street , kept by an irrepressible Irishman, Charlie Gallagher, and which no doubt ,had a plenitude of customers. At the corner of Helenvale Street , where the Library now stands, was a celebrated land mark, Browns Land where in 1850, a widely known Tollcross Primitive Methodist worker, Mr Robert Kerr ,still happily with us, was born of parents engaged in the staple industry , handloom weaving. Mr Kerr who on the 10th of this month preached in Tollcross P,M Church used to work with the old Parkhead and Westmuir Economical Society. Opposite at Montgomery’s Opening ,is the site of the Old Bog Hole, where Parkhead Bowling Club, one of the first Kitty Kissing clubs in Glasgow, had their green. Belvedere, previously referred to, was an offshoot thereof. Montgomery’s Public House was the direct forerunner of the premises of Mr, Samuel Hay Gardner. The curious whitewashed row of cottages to the right is none other than the celebrated landmark ,dear to all the old Parkhead people, The Shinty Ha. The exigencies of the road problem require its removal for very necessary road widening and removing of the built up promenade and the Shinty Ha, even as i write, is being steadily demolished. The Tramway Department has transformed the outlook hereabouts. Helenvale Football Park, the best junior pitch in the Kingdom, and the depot premises, with all amenities, have blotted out many of the old landmarks. Parkhead Juniors of whom no words need be said in explanation ,have the site of Hamiltons Park (so called after the farmer) for their present Helenslea Park. Nearby was the White Horse Inn , a hostelry that lives chiefly as the scene of a terrible drunken murder, the landlord, named Anderson ,murdering his wife in a drinking fit. The part in the article that says “Parkhead Juniors of whom no words need be said in explanation” is frustrating. I’m researching my Great Great Grandfather and believe he was the founder of Parkhead Football Club. I’ve not had much success finding out more and would be interested to know if there are any archives still in existence. In the Some of the People of the Village of Parkhead section the Alexander Stewart at 25 Browns Lane was my great grandfather. Tom Stewart was my grandfather. They then moved to 16 Elba Lane. My father was born on Dervaig St. in 1926. The Catherine Stewart was married and John Duffy and passed away in 1945. She lived on Dervaig St. at the time. Thanks Tam and Robert for the brief walk around in August 2017 with my brother and two sisters when we were on a visit to Scotland. hi yes i remember most of those people on tollcross road..I’m sure my uncles stayed at the same address…they were George and bob cairney my other aunt stayed next close Eddie and José rilley…my aunt marion and jimmy marshall stayed across the road…all nice people … great place….jim cairney.. I grew up in Lilybank in 1970’s, 78 Glenshee St, Great place, BBC filmed documentary , classing it as 4th world, Kay Carmichael and Magnus Magnusson, took part, initially 2 parts, then a 3rd called “Return to Lilybank” 2 year later, have seen first 2, but not 3rd ” The Return” has anyone come across the final part please? Does anyone know about or heard of Mackinfauld Mansions. On a death certificate of my great grandmother that is where she die at 10 Mackinfauld Mansions tollcross but someone says it came under Parkhead. I have tried the Mitchell but no-one there knows anything about them. Hello from Comely Park St in Parkhead. emigrated to Toronto in 1951 with my 2 brothers and mum. I was 1 when our ship sailed from Liverpool. So of course I cant remember a thing. We met up with my Dad in Toronto who was a bricklayer. A sad drunken thug of a man. My worst memory of Parkhead….. Going to Greens dental surgery, up the very dark stairs……. Into the most awful dentist that didn’t like children !!!!! Just recently discovered this site and it is wonderful to read about Parkhead. I lived at 139 Helensvale Street until 1950 when I emigrated to the U.S. We attended the Calton Parish Church and Rev. Young was the minister. The church was just across the street from house. Two of my sisters Margaret and Anne married in that church. Margaret married Samuel Bell who lived in Westmuir St. Anne married Eddie Houston from High St. Eventually all of us came to the U.S. I went to London Road School and then Eastbank Academy. My maiden name was Ward……..neighbors that i remember were Ramseys…..and Donaldsons. I have been doing an ancestry search and just come across your site. Extremely informative, one of the best I have come across. My grandparents (Robertsons) emigrated to New Zealand back in 1925. The address stated on the ship’s manifest had them living at 14 Parkhead Cross Row in Bellshill. The only reference I could find to this street is the “Back Causeway”. 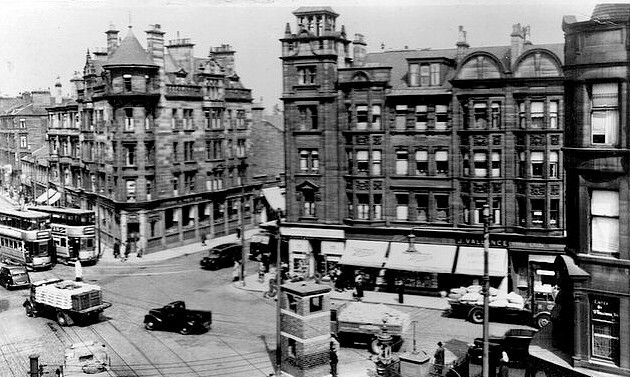 Does anyone know if this is actually Parkhead Cross Row? Appreciate any help given, Thanks you. There was a Parkhead Row in Bellshill and an area called East Parkhead with miners rows there. You can see references to Parkhead, Bellshill at this link http://www.scottishmining.co.uk/312.html Back Causeway still exists in Parkhead in the east end of Glasgow today and has nothing to do with the Bellshill area of Parkhead which is further east in Lanarkshire. Appreciate your help Bob. Thank you. I recently saw an episode of the US programme Finding Your Roots with the actor, Christopher Walken, looking back on his family history. Apparently, his mother was from Parkhead and they were discussing it. It’s on You Tube if you’re interested. Thanks very much for the heads up on this Margaret. WE supplied them with several photos for the show but they never even offered us a copy of the show never mind any thanks. They wanted us to sign over copyright of the photos to them for use in the show but we declined due to them insisting on too many legal conditions. I doubt if we will even be mentioned in the credits. They would not even tell us who the show was based on. Contrast this with another company who we supplied photos to. They gave us complimentary DVD copy of the show and mentioned us in the credits and discussion and dealings with them were so much different. That show was about the longest streets in Britain and featured Duke Street. Thanks. Just shows what goes on behind the scenes. Hi Margaret. I lived at 286 Westminster Street and I remember you and your brother Robert. My name is Michael Moran, lived at 9 Tollcross red. Attended St Michaels school. Worked at Beardmores. l had happy memories as a young lad in Parkhead. I now live in Portland Oregon USA. Great site, loved reading all the posts. Our family stayed in 1 Dalton Street in the early 50s before moving to Baillieston. Visited an aunt at 99 Caroline Street and another in Westmuir Street regularly in the 60s and 70s. Recall watching a fire in flats some time in the early 60s in either Crail Street or Sorby Street, smoke pouring out of the windows in the upper floors and all the fire engines and fire hoses trained on the building. Remember the gates being closed on the street in Duke Street at Beardmores to allow the engines to cross over along the rail lines between the two parts of the factory. My grandfather worked there in the 1940s. Connection with Parkhead re-established in the 70s working at Parkhead Social Security in Springfield Road. Still recall the wee newsagent in the now demolished row further up towards the cross, where I got my morning paper before work. Going to the Bowler’s Rest for lunch – favourite was an enormous plate of huge link sausages and mash with a pint of Tennents lager – or down to the wonderful chippie in Duke Street. Changed job in 1974 to work in Parkhead Library – even closer to the Bowler’s. Regular evening trips to the Duke of Touraine, the Anchor, Straw house and sometimes the Old Black Bull – barman there I recall was a friendly big chap called Danny. Occasionally dropped in to the Prince Charlie in Westmuir Street on the way home to Baillieston – during the summer we often walked home, stopping off occasionally at various watering holes along the way before arriving at our last stop the Kirk House. Was born and brought up in the 1950/60’s at 131 Westmuir Street, in the Tenement that was next door tae Parkhead School. Looking out of our first floor bedroom winday I could see and smell the best bakers and butchers in the whole of Glesca, Blannies and Keens. Served my apprenticeship with Parkhead Forge Firth Brown Ltd and was last Apprentice to get his time out 1979-83.Tell that to the young of today and they ask if I repaired the Shopping trolleys. My Dad a born in 1923 an grew up on Crail Street – McLuskie family…anyone else out there with parents who grew up there? Anyone remember City Bakeries? Any relation to the McLuskies that lived in Delburn St. Went to Riverside with Wullie McLuskie, he was killed on his motor bike at the corner of London rd. and Springfield rd. Wullie had a cousen John Crain or Crainie that lived on Crail Street. John was my best man when we got married in 1960. I moved to the states in 1962 and regretfully never saw him again. my grandad lived at number 8 crail st in the 1920s. I knew the McLuskies at 19 Beattock St.
My late mother Jessie McKenzie Russell and sister Helen, lived at 124, Crail St. ( straight across the road from Quarrybrae Public School) with their parents John and Chrissie Russell ( nee Morrison). The parents met and married as they worked as driver and Clippie with Glasgow Corporation Transport, before John went off in the GCT ” Pals Battalion” , (15th Glasgow, HLI if I remember it right) like many others in WW1 and served in Belgium and France, where he was badly gassed and was a semi invalid for much of the rest of his life. They stayed ” wan up” in their tenement building, and shared a landing with ” Donal’ Cameron ( a driver with Tennents brewery) and his wonderful wife, ” Leezie” Cameron ( who we all adored as both friend and neighbour) and their 4 kids , Theresa, Sam, Charlie, and ?….sorry, I’ve forgotten. My mother worked in the Beardmores munitions site during WW2, and later married my late father David McClair, a patternmaker from Craigneuk Wishaw with them re locating to Wishaw around 1953/4 time….where they had two children ( both boys) being me, Robert McClair, in 1945, and then my two years younger brother, David. Fond memories of Quarrybrae School, and playing in the rear tenement areas which we knew as ” the scabby lawn”…..which never had even the merest HINT of grass anywhere !……other memories included Wards Dairy ( on Tollcross Road just opposite the Corporation transport bus depot just a 100 yds or so down the incline from ” Parkheid Steamie” , which I used to run past…terrified at the scary sound of the steam being released there from. Never been near a steamie since..still think they must be full of monsters !. Mags, you will be a relation of mine. My dad was one of Jenny Nyguist’s children. enjoyed my day on saturday was good to see a few faces i knew and also all about where i grew up,looking forward to some more info as things progress as so much work was put into everything and so many people involved well done to all. My great grandmother was a Laurie, from Elgin street, married my great grandfather Burgoyne. Hi Jane we sent areply to the email you gave but it bounced. Loved reading Thomas Bell’s memory of Parkhead. I attended ST Michael’s Primary 1948-1953 Then on to St Mark’s Jr secondary 1953-1956.reading Thomas’s memories took me right back to my childhood. Thank You. Hi, Does anyone know perhaps know what was located at 3 Thomson’s Lane Calton in 1842? My great grandfather Thomas Irvine was born there in 1842, whereas his brother and sisters were all born in Girvan, where my great great grandmother Sarah Irvine, nee Straiton’s family all lived. What was she doing in Glasgow? By 1851 she was back living in Girvan. Was 3, Thomson’s Lane perhaps some kind of hospital or infirmary? She appears to to have been staying in Glasgow without her husband, Samuel Irvine. Glasgow PO Directories show 3 Thomson’s Lane was most likely housing with Alex Campbel, a Sherriff Officer residing there and also a Robert McGregor, a wine and spirit merchant also residing there. There was also a shuttle making business at number 18. Thomson’s Lane was later renamed Crownpoint Road. Hello Bob, my uncle lived in Crownpoint Road. I have a postcard sent to him around 1907. It is addressed to Mile End which was a wee parish near Camlachie. Best Wishes Jimmy. Hi there was a church on the Gallowgate called St Thomas Methodist Church,i am told there was a ww1 memorial in the Church when it closed around 1972 ,but nobody knows where it was moved to ,would you have any ideas. Thanks in advance. So interesting to read about Parkhead, I was born at 896 Springfield Rd behind a small shop. My dad Alex McLean grew up in the area and My Grandparents Wullie and Margaret McLean née Harris both lived at 16 Society St. I remember as a child waiting outside The Forge for my Pop who was a crane driver there, we moved to Australia in 1960 when I was 7 but I have been back a few times. The site has brought back all those conversations amongst my family of streets and people they all knew. GG Grandparents Joseph Green and Mary Green nee Gore lived at 541 Great Eastern Road both potters Anyone have a link? McAuslin Street in Townhead. I can’t find one in Parkhead. There’s no sign of a hotel on the NLS maps or Post Office Directory. Hi, just a long shot but looking to find a bit of information about a Robert Cross lived in Parkhead Area about 1933 would have been about 30 years old in 1933 he was married with a family at the time hoping someone can help me would be very Grateful for any info.Maria. Hi my name is Gary Farquhar and I stayed at 413 Janefield Street in 1966 it was the very first close in the street above the cafe on Springfield road and as you came into the close there was the remains of an old bakers shop on one side and the kitchen area to the right as you came out the close and looked across the road there was the electricity sub station still there. We were also sitting right above the railway tunnel looking down onto the old station and rail lines. We stayed there from 1965 to 1975. Trace his pension for my mother. My cousin was a spraypainter there and my uncle was a sign writer there also. The address and telephone number I quoted was from the 1943-1944 Glasgow Post Office Directory some 12 years before your time at the Croft. I will check the later PO Directories for the date you give and will get back to you. The street numbers (odd) were on the north side of the Gallowgate with the even numbers being on the south side. If you look at the photo of the Croft bridge on the page “images & transport 9” you will see the garage directly behind the bridge on the north side of the street. I have no recollection of the Croft relocating to the opposite side of the street. Perhaps this could have been an office address or even a body shop on the south side of the street. As I said I will check and get back to you. We are looking to open a local small cafe takeaway in the forge . We are looking for a theme for the cafe must be local history or relevance to area . Any ideas ? A great big thank you to Bob Winning for all his help in finding the grave I was looking for and for sending me pictures. I think it is truly wonderful that people are so dedicated to do this work by giving up their time to help others. This is a great site! I now have it bookmarked. love this site by the way,but makes me sad as well.my boyhood was spent in tollcross park and the streets of Parkheid. i come from lilybank and always said i was parkhead.was i right? I was a wee bit surprised that there were not more references to Wm Beardmores, Parkhead Steelworks, where a lot of the Parkhead people were employed and the area prospered. I worked in their research department from 1953-63 and would like to hear from any of the people who knew me. I moved from Shettleston to the midlands in 1963 and then down south in 1965 where I did some hands on metal bashing for MOD.I really enjoyed the contributions about old Parkhead, some of which were before my time! Sorry that I have not responded sooner. I shall think about your request and get back to you – if I can find the page again! my mother lived at 255 westmuir street when i was born . i am looking for anyone who knew her or has heard of her from parents or grandparents. her name was agnes (nan) lawson.we came to australia in 1950. any info at all would be great. I have just looked on the site and couldn’t believe my eyes when I saw you letter. I am thrilled it is the first time I have made contact with anyone who knew my mum and any of her family. anything you can tell me about them at the time you knew them would be great. did you know her [sister] aunt jean or anything about mums extended family. I will be waitng to hear from you with my heart in my mouth. I grew up in the four in a blocks opposite Belvedere Hospital in Newbank, I lived there in the 60sand 70s, I seem to remember that the land where the Helenvale flats are built was known as The Pancake, Does anyone know why? Hi One of my relatives is the Annie Mc Killen mentioned as head teacher at st michaels infant school in the 40s. Is there any chance anyone has some stories they could share about her. Hi folk, great site and well done and laid out. Would anyone on here by any chance of heard of a Jimmy Anderson who resided in Parkhead in the late 60’s early 70’s, he was my dad’s cousin and would have been in his 40’s at the time. I knew all the andersons catherine margret Mary was Margret Anderson Alice’s daughter Catherine was me n my sisters friend . My grat aunt lived at 146 westmuir st parkhead sometime in the early 20’s I believe. She then emigrated to USA around 1925 and married Robert Climie in Canada. She was a nurse and part time real estate agent. Just trying to find all my macGregor relatives since there is a sister of my grandfathers whom no one remembers her name. I’m trying to find out her name she died at 10 during the 17-19 flu epidemic. Since we have not heard fom you then we take it that the name we emailed you was not what you were looking for. Was it? Message	I was delighted to see the grave of my Great Grandfather James Fyfe amongst the photographs of the Janefield Merchants. The business was sold 1902/03 as his Daughter Agnes Fyfe married Joe Muir another well known publican in Bridgeton. Hi Maria, my mum Ray McLaren lived in tollcross from 1931 until the mid 1950s. She knew a David Cross who lived in her Street, Tollcross Road possibly a son of Robert. It’s a long shot but may be the same family. Nicola, where a outs in tollcross did your mother live. My fathers family were all brought up in Holywell Street,Camlackie. They were the McAuley family, Catherine,Margaret,John,James & Joseph, sadly only my dad James and his sister Margaret are still with us. He attended St Michael’s Primary and then St Marks. His sisters went to St Anne’s and St Marys schools. Often he tells us stories about playing in Jeanfield (eastern necroplis) cemetary, going down to the banks of the clyde, Camlackie Primary school, which i too remember, my dad can still tell you everyone who lived up his close no.9 and the amount of people who lived nearby in the surrounding area. When he is with you on a journey through the area he gives you a history lesson of the area, must admit enjoy it. His oldest sister Catherine lived in Cuthleton Street, in Lilleybank, her family name was Keegans, i remember the area well as we were often there as children in the early sixties and spent a lot of our lives in this area. Thanks very much for your comment. Have a look at the menu section under Reminiscences of Parkhead where you will see some memories of Parkhead from a few people. We would absolutely love to hear your dad’s (and family) memories of Parkhead which we no doubt would let us all share the history lesson as well as jogging other peoples memories and perhaps get them to contribute also. We want as many people as possible to give us their memories of the area. So please start noting down and send us your dads memories and we will publish them. Hi, Would anyone know where McCauslin Street is or was. I may have mis-spelt it, but my family lived there, they were in the tenements, a pawn shop was opposite and public baths were at the end of the street. Any help in locating this street would be appreciated. It may be McCaslin Street you are thinking of. It still exists in Townhead, Glasgow. If you type St. Mungos Church into Google Maps it will take you to McCaslin Street and you can go to street view to see it as it is today. Hi Catherine, McAslin Street ran from 19 Martyr Street to 307 Parliamentary Road and was named after John McAslin, a partner in the firm of Austin & McAslan. Parts of the street were previously known as Albert Street and Catherine Street. The street was a mixture of tenements and small works, and at number 340 stood the Catholic Apostolic Church, built in 1852 to a design by Augustus Welby Pugin. Like much of Townhead McAslin Street no longer exists. I was born in McCAUSLIN STREET IN 1953. Great to see a site about Parkhead. My mum was born at 412 Westmuir in 1913. Except for a period between 1923 and 1927 her Bradley family had always lived on Westmuir. They lived at 448 from 1927 to about 1992. My mum lived at 448 westmuir st next door to Phil Bradley. mum and Phil worked for the same company I remember Phil sister too but can,t remember her name. Sorry Ann Marie I didn’t get notice of your message. I was here today looking at old pictures. My aunt was called Mary. Her married name was Gemmell. If I remember correctly she ran a tobacconist store at one point but I’m not sure on what street. Philip Bradley died in 1992. Mary moved to the Hull area about 1980ish and died in 2010. My great grandparents name of Mulgrew lived at 412 and 418 Westmuir street at various times. I really enjoyed the site but I think you should include the presence of the Catholic schools and churches in the area for the benefit of us who attended them. Thanks for your post. We have been in touch with St Michael’s and await a reply. It is our intention to include as many aspects of life in Parkhead as possible. I think the Gibbie Watson bakery in Parkhead was my Great Grandfather Gilbert Watson who lived from Jan.4,1837 to August 4, 1894. Any more information and pictures you have would be great. I am attempting to write a children’s book about the stories that were past down to me from my mother and grandmother Margaret Gardner Gilbert’s daughter. The Gilbert Watson we refer to was born in 1799 and died in 1866. The Gilbert Watson you refer to was his son and therefore our Gilbert was your Great Great Grandfather. hi tam , when did jeanfield become janefield and why, was it just people getting name wrong? I am convinced that the White Horse Inn mentioned in the murder most foul story was actually the Tollcross Tavern building as we know it today. Seems Mr.Anderson was spared the galllows and sentence to 15 years transportation. Have a look at the page “Willox Book Characters” for info on the murder. He got off much lighter than everybody thinks. great site tam , loved the ads in the paper and the pics. This is a great site, highlighting the Parkhead area in specific details. Look forward to viewing more interesting facts as you discover them.